…con un tocco di rosso! This entry was posted in Foto, Fotografia, Grafica, Photo, Photography, Street Art and tagged dpsblue, Foto, Fotografia, Grafica, Photo, Photography, Street Art. Bookmark the permalink. Ciao Patrizia! Grazie per essere passata! Tornavo a casa dopo una serata con amici e l’ho notato…ieri con il primo occhio di sole ho scattato! !Mi sembrava che ne valesse la pena! Ha ha ha. That’s excellent. I love it when people adapt road signs so creatively. Tks for your lovely comment, Naomi! Thanks! 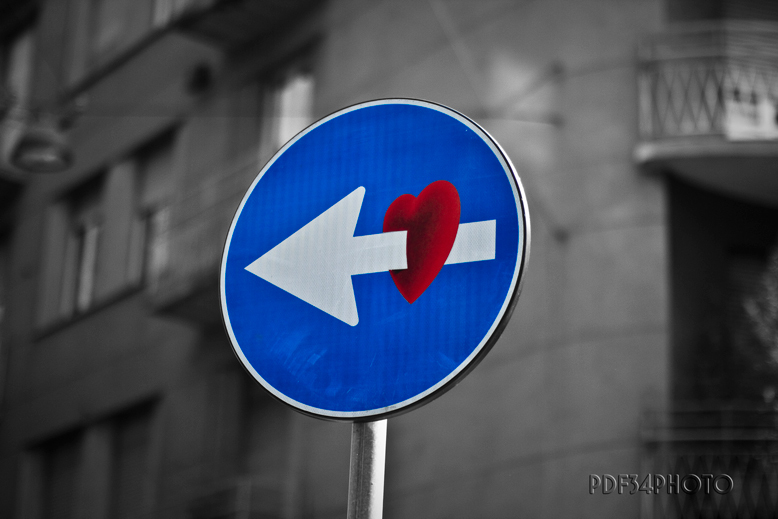 You are right…It’s really cool this “cupid” road sign! …in the grey of city you can find brilliant colors! I love pictures that are different and this is one of those! Me too! And I’m always looking for…something different! Thanks to pass by Jude! This is so cute and unique! 🙂 Love it!